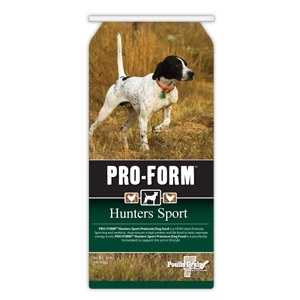 PRO-FORM™ Hunters Sport Premium Dog Food is formulated to meet the needs of the more active dog. Whether you’re hunting, training or trialing Hunters Sport Premium will provide your dog with the energy needs of a hard day’s work, at an affordable price. Chicken Meal is the first ingredient providing a highly digestible, concentrated source of protein with essential amino acids needed to maintain muscle and stamina. Brown Rice provides an excellent source of dietary fiber and energy as well as naturally occurring Vitamins and Minerals. Ground Corn processed to increase digestibility and provide an excellent source of vegetable protein as well as carbohydrate for a lasting energy source.